The following pages contain photos of some relic hunting "expeditions" and a few interesting items from my collection. 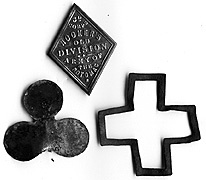 A soldier-made 2nd corps badge, from Gettysburg; And a brass 6th corps badge, from Spotsylvania. (Above, right) A broken piece of bone with a fired .58 cal. "3-ringer" in it. 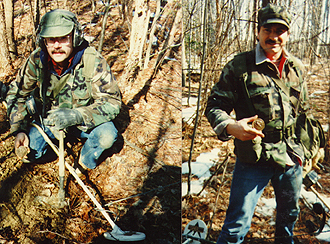 (Above, left & center) While I'm wasting my time running around the woods with my camera, Bill and Vic each find an eagle breastplate within 5 minutes of each other. 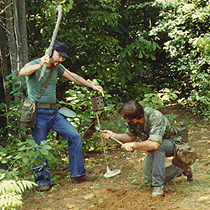 (Above, right) During warmer weather, Bill (holding the big stick) encourages Joe to dig faster.